KÜHL® is a product-driven company with a passion for the outdoor experience. We are a group of artists, designers, industrial engineers and athletes who collaborate to create great products that are timeless and in a constant state of evolution. We develop our own exclusive technical fabrics with state of the art design. KÜHL® is where function, style, art and science become one. I normally wear a size 6 (5'6 130 lbs) in Kuhl but these are a bit short in the rise and too tight. I exchanged for an 8. The length is great and the Capri option is awesome. Love this jacket. It's light to pack, really well insulated and looks great. I'm 6'1" about 175 and it fits me perfectly. Only minor complaint is that the bottom has elastic that doesn't really hold it tight so cold air can sometimes sneak in. At the price, this purchase is a no-brainer. I'm an athletic 5'5" and 136 pounds and the medium fit perfect. I just didn't like the length. It was below my knees. Just kind of plain. I disagree with other reviewers about a need to size up. I’m a 4 or 6 in other brands and the 4 fits me. Admittedly Kuhl’s sizing has been very inconsistent over the years which is too bad, because they have great clothing. My husband loves these shorts!! These are great shorts! Not too short but not old lady! For those of us who don’t want to show it all! They run small. I always order up a size in Kuhl! Love these! perfect fit! Love how these fit! Terrific board shorts! This is my second pair and I love them. I got the first pair last year and they continue to hold up well after multiple uses and washes. They dry very quickly and the zipper pockets are great. I tend to be closer to a 31 waist, but the 32 fits me perfect so you might want to size up as others have suggested. I love these! As is typical size UP! One or two sizes. I typically wear a 4-6 and ordered an 8. These are a great length as well! Not so short. Well made. As others have noted, order one size up from what you would typically wear. In Kuhl size, I usually wear a 32 but ordered a 33 instead. Fit perfectly. Quality if typically high as expected. I have yet to be let down by a Kuhl product... At least not to any measurable degree. Great shorts. Great material which are mostly nylon with a small amount of elastane. Shorts are comfortable and wick moisture away rather easily. Typical Kuhl quality which is excellent. Durability seems great so far. The waist size is a little roomier than most of my other Kuhl products. I also have the pants version and they are the same. Zappos as usual with the ridiculously fast shipping and amazing service if I ever need it. The fabric--harrumph. Wish this came in different colors and different fabric. 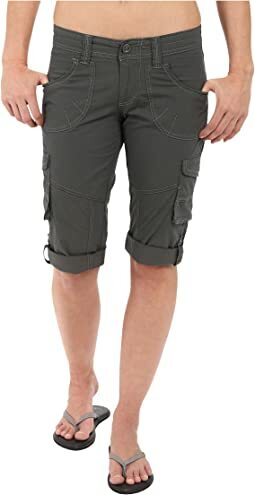 These are good shorts and hoping that they do the trick while hiking. A tiny bit snug, but the Kuhl pants that I have were the same way until I wore them a couple times. True to KUHL, these shorts are great. Style, fit, versatility..perfect river shorts. I am 5'4" tall and weigh 125 lbs, I got these in a size 4 (which I wear with no issue) and they fit but were a little tight across the hips, they would have worked but I prefer a looser (but NOT baggy) fit. The 6's fit great, they are comfortable, there are lots of pockets and they are roomy and useful. My wife is 4'10' and 86 lbs and got a size 2 and they fit her perfectly. I love these pants! The only improvement I would suggest is adding a pocket just below the existing thigh pockets. They fit perfect, love the style, love that there are 5 pockets, including the 2 zippered side pockets. 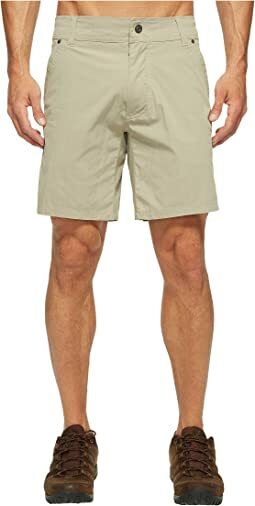 The front pockets could be a little deeper as others have commented, and it would be great if they released this model with a drawstring option (like the mutiny short) instead of the snap - for me it wasn't an issue, because they fit absolutely perfect, I am not worried about getting these yanked off during a swim. Kuhl listens to their buyers, and has installed belt loops. would definitely recommend. if you surf, get the mutiny short, because the snap/button on these will dig into your situation. they fit true to size. great shorts, fit well, stylish. love that there are 2 zippered pockets. they did run a size small in the waist as others said in the comments. Runs true to size - not too loose nor slim. I’m 5’9” 41” chest, 32” waist and a medium fits fine with room to layer (seems to be more of an “athletic” fit). Remarkably thin yet warm. 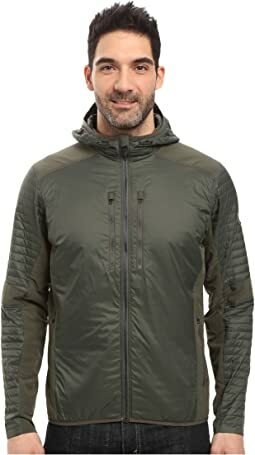 I’ve worn this down in the mid 40s with a long sleeve T-shirt with no issues and down in the low 30s (with gusts) with a lightweight merino wool base layer with a lightweight fleece pullover and was plenty warm. Insulates as well as down or even better but without the bulk (even while wet). 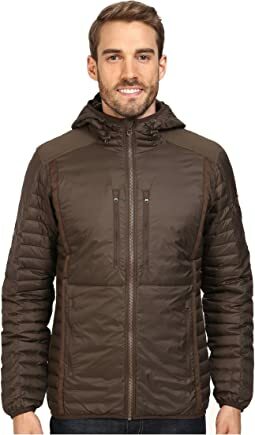 The PrimaLoft used in this jacket is the Gold level insulation (PrimaLoft’s top end insulation - you don’t find too many jackets at this price point using this level of insulation). The outer shell is water resistant and will repel a light rain but in a downpour, you will get wet. If you plan on being in cold rain, you could throw a waterproof shell over this and be plenty warm. Tends to run slightly small. If you are on the bigger side of your size, I would go up a size, especially if you want to layer underneath.